Can I cure UV conformal coatings and adhesives in a UV Curing Cabinet System? The answer to this question is yes for most UV cure coatings. The key will be the amount of process time it will take to complete the cure. In terms of actual curing the wavelength of the UV lamp and the UV cure material will need to be compatible. This can be confirmed by checking the Technical Datasheet from the material supplier. Then it will be a question as to how much actual energy is needed to cure the coating. Again, this can be discussed with the material supplier. Click UV Cure Equipment or Contact Us now to find out more. What are the differences in the UV Meters for monitoring UV light? There are two types of UV meter that we are concerned with for conformal coating measurement. These are the UV Irradiance Meter and the UV Exposure Meter. The exposure meter gives you a reading based on intensity and time. This reads in mJ/cm2. Generally the exposure meter is used for conveyor belts and fixed time exposures and ensures that the right energy is given to the conformal coatings and adhesives. Its also possible to have both exposure and irradiance built into the same Meter. This gives you the best of both options. 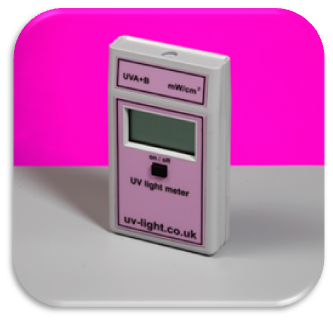 For further information on the two devices click UV Light Meters or Contact Us directly. How do UV cure conformal coatings differ to solvent and water based coatings? UV cure conformal coatings cureswith UV radiation and therefore the material is almost instantly cured if the right light source is used. The UV light you need for curing UV conformal coatings can be a mix of UVA, UVB and most importantly UVC. this will depend on the manufacturers formulation. However, the radiation can be dangerous if exposure is not controlled due to its high energy. Therefore, the UV light must be contained within a suitable system with safeguards against exposure. Conveyor UV cure ovens like the systems SCH offer are built to ensure exposure is avoided. Other benefits beyond the fast cure are that UV cure coatings generally do not contain solvents or water within it meaning 100% of the product is coating and the product is classed solventless. Therefore, there are another two advantages. First, what you deposit when coating is what remains after curing. Second, you can reduce your solvent (VOC) emissions which can be important. For instance, when you spray UV 40 it does not reduce in thickness like solvent and water based coatings, which are a blend of resin, chemicals and most importantly, the carrier solvent or water. You could spray a wet film thickness of 100 microns (0.1 mm) down and for solvent and water based coatings, the solvent and water “evaporate” leaving a thinner dry film thickness of approx 30-40 microns. The rest of the coating has volatised off into the atmosphere and is wasted. There is no evaporation with UV40 so if you coat 100 microns it dries 100 microns. Therefore, waste can be minimised. Another important factor to consider for UV cured coatings are their secondary cure mechanism. This means that any coating not initially fully cured with the UV light will still continue to finish curing on it own. This is important because of shadowing effects which can be detrimental in curing. If you coat a PCB with a VU cure material some coating could get into areas where there is no way the UV light can get to it for curing. The coating is effectively in shadow from the UV radiation. The coating could then stay liquid which is not good (most coatings are conductive whilst wet and shorting on the PCB can occur where electricity can travel where it shouldn’t. Think of water and electricity. They don’t mix!). Therefore, a secondary cure mechanism is critical. For many coatings, the secondary cure mechanism is moisture from the air causing the coating to cure. However, this is a much slower process and can take hours. This also means you need to handle the material carefully in storage and loading since exposing the coating to too much air can start the cure mechanism prematurely. All these positive points mean for the high volume markets like the automotive industry this is a very important material with advantages such as speed of cure and no solvents. click UV cure conformal coatings FAQs for further information on this area. Ultra-violet radiation forms part of the electromagnetic spectrum and is invisible to the naked eye. The wave length of UV radiation varies from 100-400nm, finishing in the blue portion of visible light. Click Conformal Coating UV cure FAQs for further information.